This addendum gives the tenant sweeping rights to space adjacent to its premises, and even covers space not yet constructed by the landlord. The addendum is to be executed at the same time as the lease for the original space the tenant occupies. The addendum is very specific about the terms and conditions that apply to space the tenant decides to take down pursuant to the addendum's language, including the landlord's construction obligations. This RIGHT OF FIRST OFFER AND RIGHT TO NEGOTIATE AGREEMENT ("Rights Agreement") is executed with respect to that certain Lease (the "Lease") of even date herewith by and between COMMERCIAL PROPERTY LANDLORD, INC., a __________________ corporation (“Landlord”), and AGREEABLE TENANT, INC., a _________________ corporation (“Tenant”). Capitalized terms used in this Rights Agreement shall have the same meanings set forth in the Lease except as otherwise specified herein and except for terms capitalized in the ordinary course of punctuation. Should any inconsistency arise between this Rights Agreement and any other provision of the Lease as to the specific matters which are the subject of this Rights Agreement, the terms and conditions of this Rights Agreement shall control. SECTION 2. RIGHT OF FIRST OFFER. (a) Landlord hereby grants Tenant a one-time right of first offer to lease the "Offer Space" (as defined below) during the period beginning on the execution date of the Lease and expiring twelve (12) months prior to the Expiration Date of the initial Term (or at the end of the initial Term if the Option to Extend is validly exercised and effective) (the "Right Period"), upon and subject to the terms and conditions of this Section (the "Right of First Offer"). (b) Offer Space shall mean the space which: (x) is adjacent to the Premises in the existing Building (and Offer Space shall not include any expansion of the Building constructed after the execution date), and (y) is or becomes "Available" (as defined below). The term "Available" shall mean that the space in question is, or is expected by Landlord within a reasonable time to become, vacant, unencumbered and free and clear of all claims and rights of other parties and, without limiting the generality of the foregoing, space shall not be Available if as to such space there is a lease, lease option or option or other right of extension, renewal, expansion, refusal, negotiation or similar or other right, either: (i) pursuant to any lease or written agreement which is entered into on or before the beginning of the Right Period or which is in negotiation (either at the proposal or lease stage) at the beginning of the Right Period and thereafter entered into, or (ii) pursuant to any extensions or renewal of any of the foregoing, whether or not set forth in the original lease or written agreement, or (iii) pursuant to any amendment or modification of any of the foregoing (no matter when executed). (c) Tenant acknowledges and agrees that Landlord has disclosed that as of the execution date of the Lease, all of the Offer Space is vacant and Available and that Landlord may give Landlord's Notice at any time. Nothing herein shall be deemed to limit or prevent Landlord from marketing, discussing or negotiating with any other party for a lease of, or rights of any nature as to, any part of the Offer Space, but during the Right Period before Landlord makes any written proposal to any other party for Offer Space, or contemporaneously with making any such proposal, Landlord shall give Tenant written notice ("Landlord's Notice") that the Offer Space is then Available or of the date Landlord estimates the Offer Space will be Available. Tenant shall have ten (10) business days after Landlord gives Landlord's Notice (the "Election Notice Period") in which to give Landlord written notice ("Election Notice") of Tenant's election to exercise this Right of First Offer to lease of all (and not less than all) the Offer Space. (d) In the event Tenant duly and timely delivers its Election Notice to Landlord, the Offer Space shall be leased by and to Tenant upon and subject to the same terms and conditions contained in the Lease except as follows: (i) Tenant shall accept the Offer Space in its then "shell" or "as-built" condition (as applicable) and "AS IS" condition without any obligation of Landlord to repaint, remodel, improve or alter the Premises for Tenant's occupancy or to provide Tenant any allowance therefor, but such space shall be delivered broom clean and free of all tenants or occupants and their property; (ii) Landlord shall deliver the Offer Space to Tenant no later than ten days after execution of the amendment described below in the event that the space is then vacant or, if not then vacant, no later than sixty (60) days after Landlord regains possession of the Offer Space; (iii) the term of Tenant's lease of the Offer Space shall commence on such delivery date and continue for the remaining Term of the Lease (including all extensions pursuant to the Option to Extend); (iv) upon such delivery, the Offer Space shall be part of the Premises under the Lease, such that the term "Premises" in the Lease thereafter shall refer to the space in the existing Premises plus the Offer Space; (v) starting on such delivery date, Tenant shall pay Rent (including all Monthly Base Rent, Rent Adjustment Deposits, Rent Adjustments and other charges payable by Tenant for utilities and otherwise) with respect to the Offer Space in addition to the existing Premises, (vi) additional Monthly Base Rent for the Offer Space shall be calculated at the same contract rates per square foot of Rentable Area as those for Monthly Base Rent for the existing Premises then applicable under the schedule of Monthly Base Rent for the existing Premises, increasing as and when such rates increase for the original Premises (for example, if the delivery date for the Offer Space occurred at the beginning of the fifth month of the Term of the Lease, the Monthly Base Rent for one month would be $_______ (the same as the rate for the fifth month of the Term of the Lease), and for the next month through the ___th month of the Term of the Lease the rate would be $_______ monthly per square foot of Rentable Area, and for next ___ months the rate would be $_______, and so forth through the end of the Term of the Lease); (vii) Tenant shall pay Rent Adjustment Deposits and Rent Adjustments with respect to the Offer Space calculated with the additional Tenant's Share for the Offer Space, and Tenant's Protection Period from a Transfer Increase (as applicable both to the original Premises and the Offer Space) shall expire on the day before the fifth anniversary of the Commencement Date of the original Premises; (viii) Tenant's Share, Tenant's Parking Area shall be adjusted to correspond to the addition of the Offer Space; and (ix) Landlord shall prepare an amendment to the Lease for the lease of the Offer Space on such terms and conditions, and Tenant shall execute such amendment within five (5) business days after Landlord gives Tenant the draft amendment and Landlord shall execute it thereafter. (e) If Tenant either fails or elects not to exercise its Right of First Offer as to the Offer Space covered by Landlord's Notice by not giving its Election Notice within the Election Notice Period, or if Tenant gives Tenant's Election Notice but does not timely execute the amendment prepared by Landlord for the lease of the Offer Space, then in any such event Tenant's Right of First Offer shall be null and void and at any time thereafter Landlord shall be free to lease such space to any third party on any terms and conditions whatsoever. 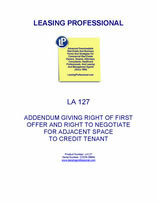 (f) This Right of First Offer is personal to AGREEABLE TENANT, INC. and may not be used by, and shall not be transferable or assignable (voluntarily or involuntarily) to any person or entity other than an Affiliate which is an assignee of the Lease pursuant to the terms thereof, and such Affiliate may exercise the right without Tenant joining in or consenting to such exercise, and notwithstanding anything to the contrary, Tenant shall remain liable for all obligations under the Lease, including those resulting from any such exercise with the same force and effect as if Tenant had joined in such exercise.